Agile is one of the newer project management methodologies, and provides a very different and exciting approach to managing any kind of research and development project, whether that’s for software, or engineering design, or website development. Agile is an iterative process of software development, it’s not related to the programming language or the type of computer it’s going to ultimately run on. The software development project is broken down into sprints or timeboxes that deliver usable functionality at each iteration. 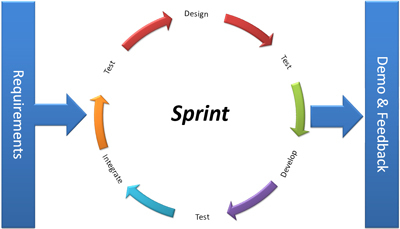 Each sprint comprises of 8 phases, starting with determining the user requirements, from there it moves into a design-test-develop-test-integrate-test loop until the requirements are met. From there the deliverable code is demonstrated and feedback is received from the stakeholders, which is then used to help generate or modify the requirements for the next sprint. During each sprint process the requirements are crossed off as they’re met on what is referred to as a burndown chart. This gives the team a strong indication of how the sprint and the overall project is progressing. The process creates a very rapid delivery of useable software that meets the most important user requirements first.